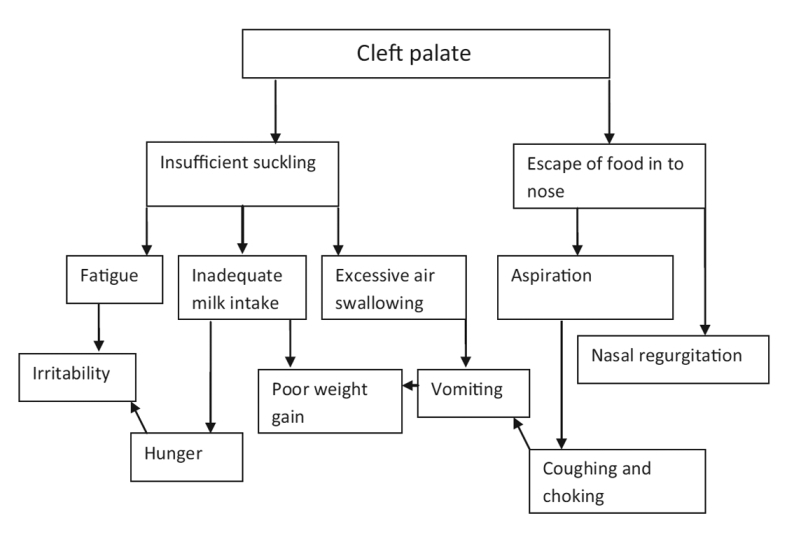 Cleft lip and cleft palate are the most common craniofacial anomalies that have an incidence of 0.28 to 3.74 per 1000 live births globally. Due to the great advancements in the field of medical science, these anomalies can today be corrected. However, it cannot be ignored that the parents of these patients may face psychological stress due to the cleft defects in the baby. Also, these conditions may cause financial difficulties to the parents and cause anxiety to the mother about the proper feeding of their infant. Feeding problems can range from excessive air intake to failure to thrive. As the management of such cases is lengthy and includes a multi-disciplinary team approach, it is the role of the Pediatrician/Pedodontist to educate the mother about the proper feeding techniques. In this article, we have reviewed and highlighted the various traditional and advanced devices and techniques which help in the successful management of these individuals. Smoking is a prevalent behaviour in the population. The aim of this review is to bring to light the effects of smoking on dental implants. These facts will assist dental professionals when implants are planned in tobacco users. A search of "PubMed" was made with the key words "dental implant," "nicotine," "smoking," "tobacco," and "osseointegration." Also, publications on tobacco control by the Government of India were considered. For review, only those articles published from 1988 onward in English language were selected. Smoking has its influence on general as well as oral health of an individual. Tobacco negatively affects the outcome of almost all therapeutic procedures performed in the oral cavity. The failure rate of implant osseointegration is considerably higher among smokers, and maintenance of oral hygiene around the implants and the risk of peri-implantitis are adversely affected by smoking. To increase implant survival in smokers, various protocols have been recommended. Although osseointegrated dental implants have become the state of the art for tooth replacement, they are not without limitations or complications. In this litigious era, it is extremely important that the practitioner clearly understands and is able and willing to convey the spectrum of possible complications and their frequency to the patients. Context: The success of atraumatic restorative treatment (ART) technique depends on the restorative material; hence, clinical studies with various materials are necessary. Aim: The aim of the present study was to clinically evaluate and compare the nanoionomer and high-viscosity glass ionomer using United States Public Health Services (USPHS) Modified Cvar/Ryge Criteria with ART approach. Materials and Methods: Two primary molars in 50 healthy children aged between 5 and 8 years were selected for the study. The teeth were treated with ART and divided into two groups. The group 1 teeth were restored with nanoionomer (Ketac Nano 100 3M ESPE) and group 2 with high-viscosity glass ionomer cement (HVGIC), (Fuji IX GC). Each restoration was evaluated using the USPHS Modified Cvar/Ryge Criteria at baseline and 6 months' and 12 months' time interval. Statistical analysis used: Chi-squared (χ2 ) test. Results: Nanoionomer was significantly better than HVGIC with respect to color match at baseline, 6 months, and 12 months (P<0.001). Nanoionomers were also significantly better than HVGIC in case of cavosurface marginal discoloration and marginal adaptation (P<0.001) at 6 months and 12 months. There was no significant difference between the two materials with respect to secondary caries at 6 months (P>0.05), but at 12 months, nanoionomer was statistically better than HVGIC (P<0.05). There was no statistical significant difference with respect to anatomical form and postoperative sensitivity (P>0.05). Conclusion: The results indicate that nanoionomer can be a successful alternative restorative material for use with ART technique. Aim: In the deprived communities with high caries incidence, determination of high-risk children in early age is a valuable tool to apply the individual and/or community-level preventive measures. The purpose of this 5-years follow-up study was to examine the relationship between early caries occurrence on primary incisors and the future caries occurrence on both first permanent molars and all permanent dentition in the children living in rural Turkey. Materials and Methods: Total 34 children living in rural-districts of southeastern Anatolia were included, and divided in both test (caries positive for maxillary primary incisors) and control groups (caries free on the same teeth). During the 5-years they were examined annually regarding new caries occurrence in either first permanent molars for the Decayed, Missing, Filled Tooth Index [(DMF(T)  )] or all permanent dentition (DMF(T)). Results: At the beginning of the study, the age range of the children was 3 to 5 (mean ± St dv; 4.03 1.24), and d(t) [max 1,2] and df(t) indices for the deciduous dentition of test and control groups were 2.65 ± 0.78; 4.29 ± 2.08 and 0; 0.24 ± 0.43, respectively. After 5-years mean DMF(T)  and total DMF(T) for test and control groups were 1.88 ± 0.66; 3.12 ± 0.69 and 0.47 ± 0.62; 0.65 ± 0.93, respectively ( for each parameters the difference was statistically significant P < 0.01). For test group the number of caries on primary-incisors (d(t) [max 1,2] ) was correlated with the DMF(T)  (r = 0.80) and DMF(T) (r = 0.59). Conclusion: The caries-information including the early primary incisors could be helpful in identifying children with increased risk so that preventive measures could be directed at those who fit the high-risk-caries profile. Context: Survey. Aims: To evaluate dental awareness and periodontal health status in different socioeconomic groups in the population of Sundernagar, Himachal Pradesh, India. Settings and Design: Cross-sectional study. Malerials and Methods: This cross-sectional study was conducted in 300 patients with different socioeconomic status who visited Himachal Dental College, Sundernagar, and Dental OPD of the Civil Hospital, Sundernagar. Mouth mirror, CPI probe, and illuminated light source were used for examination. Periodontal health status was recorded using CPI index. Information about their lifestyle, education level, and socioeconomic status was recorded using a questionnaire and correlated with the periodontal status. Statistical Analysis Used: Chi-square test. Results: Majority of the subjects used toothbrush and toothpaste to clean their teeth once daily. 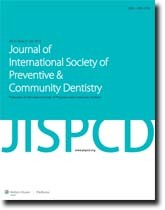 Lower socioeconomic groups exhibited higher CPI scores characterized by bleeding gums and calculus deposition. The differences were statistically significant across various social strata (P < 0.01). Conclusions: The utilization of the questionnaire on dental awareness facilitates the inclusion of multiple aspects of patient information. The study revealed that oral hygiene awareness and periodontal condition were significantly associated with socioeconomic status. The socioeconomic status and oral hygiene practices were significantly associated with CPI (P < 0.01). Aim: The present study attempts to explore the oral hygiene practices and oral health status in autistic patients as compared to nonaffected, same aged healthy individuals. Materials and Methods: The oral hygiene practices, prevalence of caries and periodontal status were evaluated in 117 autistic patients and 126 healthy individuals. The test and control groups were divided into three categories, based on the type of dentition as Primary dentition (Category 1), Mixed dentition (Category 2) and Permanent dentition (Category 3). Plaque and gingival status was recorded by plaque index (Loe, 1967) and gingival index (Loe, 1967), periodontal status by community periodontal index of treatment needs and dental caries by DMFT/DEF index. Statistical analysis was done using descriptive statistics, independent sample t-test, contingency coefficient test and one-way ANOVA test by SPSS 14 software. 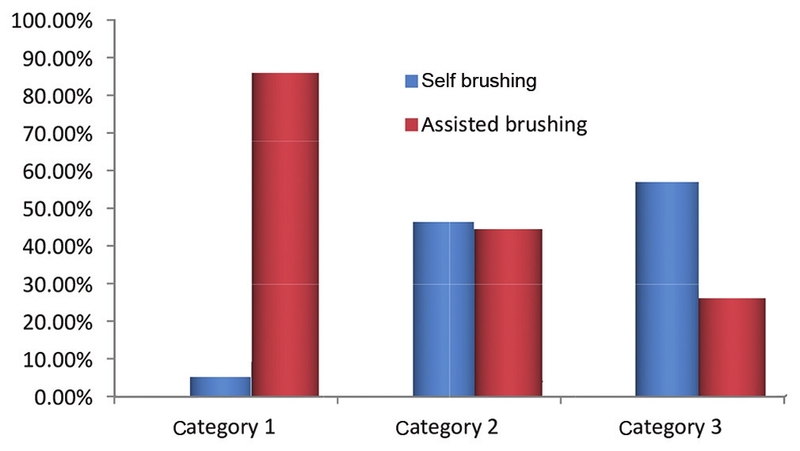 Results: There was no statistically significant difference in the brushing habits between autistics and controls ( P = 0.573); however, Autistics required assistance in brushing. Prevalence of caries was significantly lower in autistic patients ( P = 0.000). Plaque and gingival scores were significantly higher in autistic patients ( P = 0.000) and prevalence of periodontal disease was significantly higher in autistic patients ( P = 0.000). Greater number of autistic patients required professional scaling and root planing ( P = 0.000). Conclusion: The present study suggests that autistic patients have a higher rate of periodontal disease and lower caries compared to controls. Attempts should be made by parents, general dentists and periodontists to teach oral hygiene methods to these patients by constant repetition and patience, as autistic individuals can develop skills over a period of time and lead a more productive and independent life. Context: Tea is a rich source of fluoride (F− ) and its consumption has become a cultural habit. F− available from tea might play important role in increasing total F− intake leading to dental fluorosis. Aims: To estimate F− concentration in different varieties of commercially available tea, in Mathura city, and to determine the change in concentration of F− in different forms of tea infusion, prepared by different methods. Setting and Design: Mathura city and Clinical study. Materials and Methods: 16 brands of tea were collected from the local market, out of which 3 were dip tea, 2 were leafy tea, and 11 were tea granules. Tea infusions were prepared from three forms of tea by three different methods, i.e., without boiling with water; after boiling with water; and after addition of milk and sugar to boiling water. F− concentration of those tea infusions was measured using a F− ion selective electrode method. Statistical Analysis Used: One-way ANOVA was used to compare mean F− concentration in tea infusions prepared by three different methods, irrespective of the form of tea and mean F− concentration between tea infusions prepared from three different forms of tea, by three different methods. Results: The mean F− concentration in tea infusions prepared by three different methods irrespective of the form of tea were 1.437, 3.375, and 3.437, respectively, and tea infusion prepared from tea granules irrespective of method of preparation showed a statistical significance. Conclusions: F− in tea can be an additional dietary source of F− which can be beneficial in preventing dental caries or deleterious for occurrence of fluorosis. Objective: Gingival recession (GR) is a common manifestation in most populations, and is considered as an early sign of periodontal disease. GR is an intriguing condition where various factors play an important role in its etiology. Only few studies have been undertaken to assess the prevalence and risk factors for GR in patients visiting dental hospitals. The aim of this study is not only to estimate prevalence, severity, and extent of GR in hospital population, of Vishnu Dental College, Bhimavaram, Andhra Pradesh, India, but also to assess the potential risk factors for the same. Materials and Methods: In this study, 2837 patients were examined of which 627 were included into the study. The age range was 16-80 years. Subjects were interviewed using a structural questionnaire, and full mouth clinical examination was done to assess recession. Results: Of all subjects examined 45.6%, 16.2% of individuals and 13%, 4.8% of teeth per individual showed GR >3 mm. Prevalence and severity of recession was correlated with age. Recession was present but recession threshold ΃3 and ΃5 mm affected only small percentage of teeth in subjects younger than 45 years. Mandibular incisors showed the highest prevalence of GR ΃1 mm with 61% of teeth being affected. Smoking and presence of supragingival calculus were most significantly associated localized and generalized recession. Conclusion: Prevalence of periodontal disease is high among this population based on the presence of gingival recession in most the individuals. High prevalence of GR is significantly associated with supragingival calculus and smoking habits. This suggests a need to improve their periodontal condition through education, motivation, and improving their periodontal health.